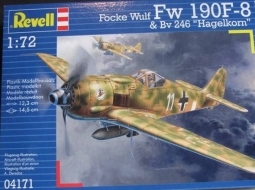 Following the successful entry of the Focke-Wulf Fw190 A series of fighter aircraft over the English channel during the autumn of 1941, the German RLM requested a high altitude version to complement the fighter fleet, and three projects were started. 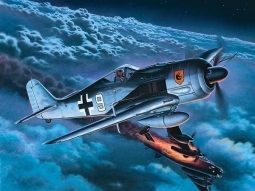 The Fw 190B used the BMW 801 turbo-supercharged radial engine and a pressurized cockpit, but very few of these were built. 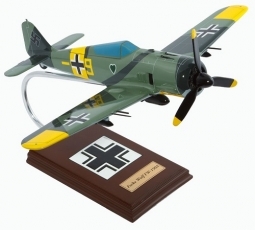 The Fw190C was powered by a 1,750 hp Daimler Benz DB603A in-line engine, of which three prototypes were built. 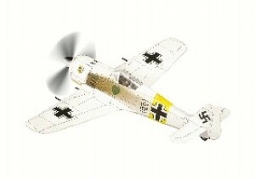 The third high altitude project was based on the Focke Wulf Fw190A airframe and powered by a Junkers engine. The fuselage was lengthened to accommodate the V-12 cylinder, liquid cooled, 1,750 hp Jumo 213 engine, and made its initial flight during the winter of 1941-42. 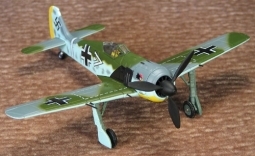 Five further prototypes were produced, plus a small batch of Fw190 D-0s were completed from standard production Fw 190A-7 airframes. These pre-production aircraft were followed by the Fq-190D-1s which had the increased area vertical fin and rudder. 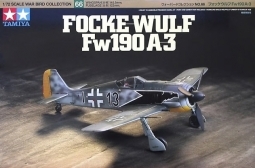 There were no Fw 190 D-2 through D-8 designations. 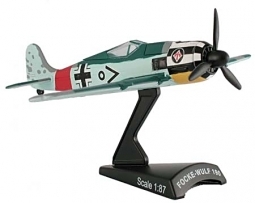 The Fw-190D9 began production in June 1944, with early versions having the flat topped canopy, and from W.Nr 210001 onwards having the Galland hood (blown canopy). 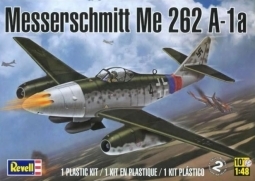 It went into combat with the III/JG 54 "Grunherz" (Green Hearts) in September 1944, at Achmer, Germany, as top cover for the new Messerschmitt Me262 jet fighters then entering service.